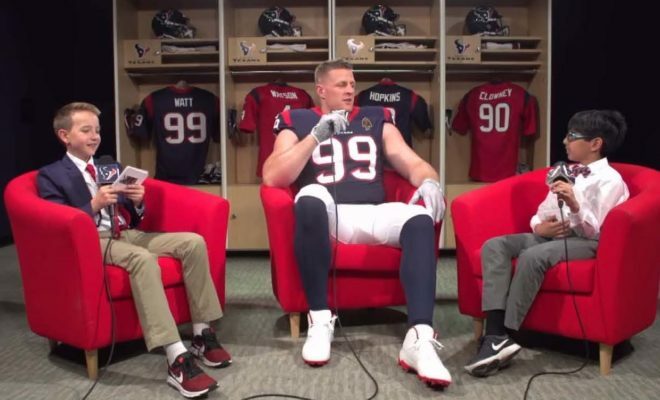 In a segment called “Kid Reporter” from the Houston Texans, J.J. Watt recently sat down with some intrepid interviewers to talk shop. The video, posted to the Texans Facebook account, shows Watt giving his best answers to some interesting questions posed by the actual kid reporters. The latest segment features two young boys asking the Walter Payton Man of the Year the questions their fans will appreciate. Watt is a three-time NFL Defensive Player of the Year. His foundation has raised $41.6 million in relief funds for Houston, Texas, and surrounding communities following Hurricane Harvey. Although injuries have somewhat sidelined him over the past two NFL seasons, Watt is back in great health and high confidence. With questions like, “Do you make your brothers call you Man of the Year?” he needs that confidence to dish out some savvy responses. The Houston Texan kid reporters take the cake with their classy, professional looks and unique interview styles, but their segments have seen some true talent take center stage. Running back Lamar Miller and number one overall draft pick Jadeveon Clowney have both sat in the hot seat in advance of Watt, among others. Asking some fairly pointed questions, Watt handles the convo like the pro he is, even going so far as to talk T.V. programming with the young interviewers, saying if he had his own show it would be called “Watt’s Up.” This segment was shared on the team’s Facebook page, but if you’re looking for more Texans Kid Reporter interviews, there are some great clips found on the team’s official YouTube channel at the link provided here.